Inspiration is a funny beast, isn’t it? It strikes at the strangest of times and decides to up-sticks and leave you alone at others. For example, I almost invariably get most of my favourite plot ideas whilst driving home from any sort of gathering (be it LRP, or convention or similar). Then, when I get home and try to translate it from the terrifying interiority that exists inside my skull to the screen… nothing. Gibberish. Seriously, the screen may as well read ‘sdkldblkjb lkm lkdsgk lk mlefjlkmcv’ for all the sense it makes. In my head, I scream silently, this was bloody amazing! The first person to invent a device that allows you to plug your brain directly into a USB socket and get those thoughts down before they turn to mush will be a fine individual indeed. Generally, I do OK getting thoughts and ideas out of my brain and onto the keyboard. I type infuriatingly fast (accordingly to one of my friends) and that helps with the brain to keyboard process wonderfully well. The real problem for me stems from the fact that when I talk, I am always thinking about four or five sentences ahead of myself. Does that make any sense? I have no idea why it is that I do that, but every so often it means that in the middle of a conversation I’ll just stop dead and completely and utterly forget where I was. So even with the infuriating level typing speed, this means that occasionally, when I’m writing down thoughts and ideas, the same thing happens. My way around this has become quite simple. Initial plot ideas now get produced as stream of consciousness. Silly comments and all. Then I go back over them and refine them; take out the silly comments and make them into more acceptable working documents. For example, when brainstorming with m’colleague John French on our tied-together stories that appear in Architect of Fate, the following was in the original outline that I shared with him before the story was completed. Apparently it made him giggle. This sentence gave rise to the story’s ‘code name’ of Project: Hotdog. Note: all my stories end up with code names. I’ve never quite been sure why this is, but it’s entertaining and allows me to happily discuss something I’m working on without the worry of openly acknowledging what it is. For example, I recently turned Project: Needles into the editor, am working on edits for Project: Comeuppance and working hard(ish) on Project: Carpark. For reference, The Gildar Rift is the only story that never had a project codename. Going on how excited I was to be writing a novel which was rapidly tempered by the discovery of how hard it actually is to write a novel whilst working full time, it should have been Project: Harsh Reality. I enjoy stream of consciousness plotting. It allows me to express what I’m feeling without the constraints of the formality a pitch requires. I should really have kept some of the early drafts of the plot development of The Gildar Rift, for example. Had my former hard drive not imploded with the spiteful force of a device hellbent on eating 67k words of a manuscript – which it also accomplished, hooray for the 47k previous emailed-to-self back-up copy – I’d have had that to hand. So inspiration strikes in the strangest of places. Whilst driving along and catching a glimpse of roadsigns (the A1, for example, features many would-be Hollywood actors. Burton Coggles. Kirk Smeaton to name but two). For Sale signs, or… any number of things. A half-empty field with a single van parked in the almost exact dead centre. 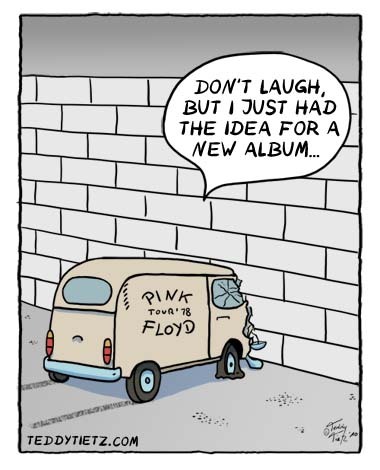 Why is that van there? What is it doing? Ever since I was little, I made up stories based on things I saw as we were driving along – a pastime my mum encouraged to stop me being car sick, I suspect. Inspiration does not yet come in some kind of handy ‘tap-turning’ form. There’s no magic switch to press that turns humdrum reality off and switches over to the delightful silliness of idea forming. It just happens. I wish it was more controllable though. There’s not much more embarrassing than white-noising out an entire meeting whilst your brain contemplates exactly how it is you’re going to deal with that Silver Skulls Space Marine who is demanding you pick up his story and create Project: Surprise! Someone get to work on that USB device, please. Chop, chop. This entry was posted in General, ranting, Writing. Be it something I saw around me or a phrase from a song or sth from a radio. Growing up, my mum referred to the way my brain functioned as “making three left turns to go to the right”. I got where I was supposed to go, but not in the same manner. Especially when I write freely, it is not where I start that is fascinating but where I end up. And then trying to figure out when I get there, how I got there. And when that plug-in brain to USB port connector arrives, if you get the first one, then I get the next … I cannot even begin to count the number of great ideas that I have had driving (and one can do a lot of driving to get anywhere in Oregon) that for obvious reasons I have lost. The toughest part for me have been the few times in which I did write myself a quick note on a brilliant idea. Then find it a while later and have to ask myself, ‘where were you going with this?’, ‘what did you mean by…’ give up and toss the note away. Two days later, I get hit with the same inspiration in a place I can’t even write a note, recognize the irony that it will become completely useless and lost, or worse…wasn’t that great of an idea.